Lindt chocolate, clock towers, the Alps, rösti – what’s not to love about Switzerland? When it comes to spectacular landscapes, architecture and food, this European country has it all. However, sometimes having it all comes with a price…literally. Time Out London recently released their 2017 list of the Top 10 Most Expensive Cities to Live In, and Switzerland’s largest cities, Zurich and Geneva, are on the list for the umpteenth time. 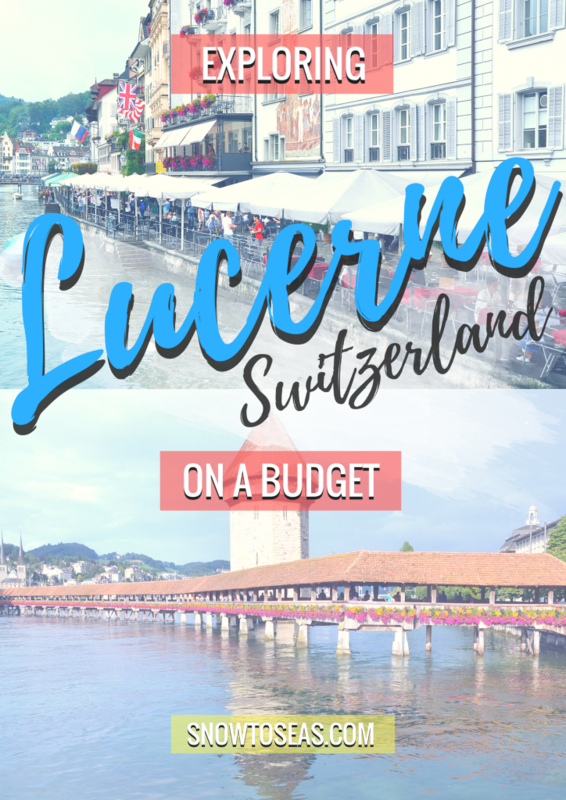 The Swiss city of Lucerne, one of my stops from last summer’s Interrail Adventure, is not exempt from the “pricey” situation either. Now, before you cross a trip to Lucerne off your Eurotrip itinerary, I have some incredibly amazing info to share! Breaking the bank while visiting Lucerne is completely unnecessary! You CAN experience the incredible sites and attractions the city has to offer even if you’re on a budget. 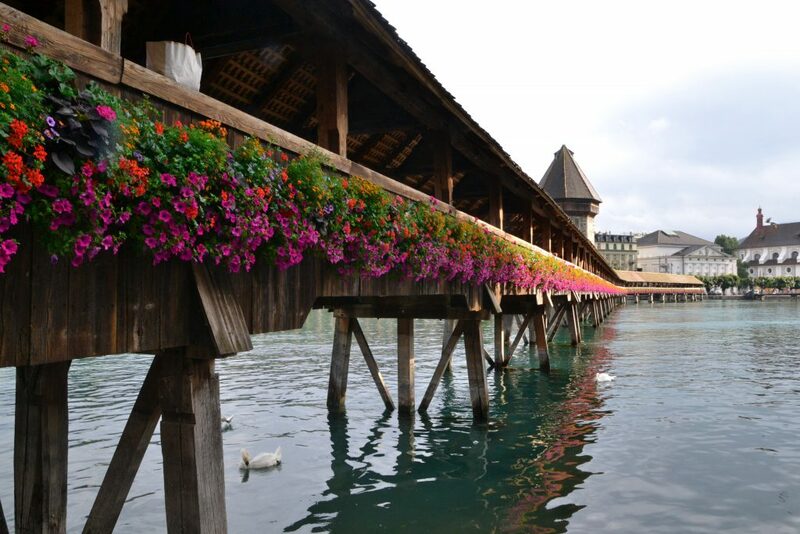 The Chapel Bridge, known as the Kapellbrücke, is possibly Lucerne’s most famous landmark. The wooden pedestrian bridge crosses the Reuss River in Lucerne’s city centre and is absolutely FREE for visitors to walk across. The bridge was built in the 14th century. 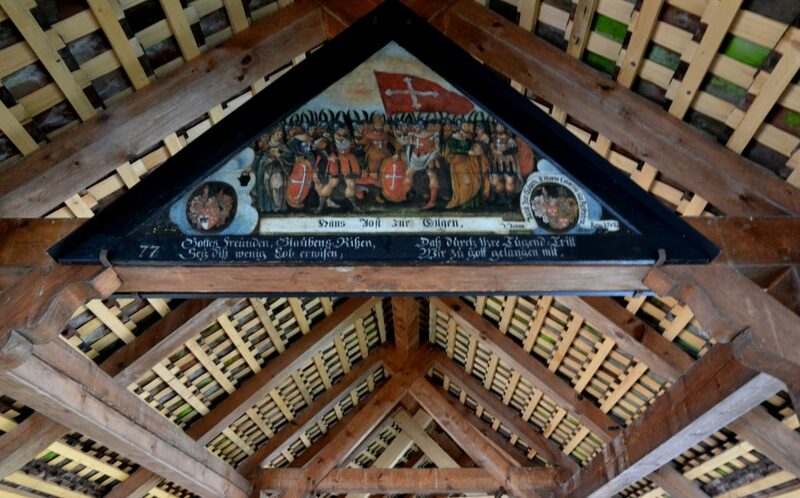 Inside the bridge, you can find paintings depicting the city’s history. They were added in the 17th century. However, most of the paintings you see today are restored paintings because a fire destroyed many of the originals over 20 years ago. This covered, wooden bridge is really a unique sight – it’s actually the oldest one in Europe. So not only do I recommend walking across bridge, but I recommend walking around it too! It’s admirable from every possible angle. You’ll also never see anything like it anywhere else! 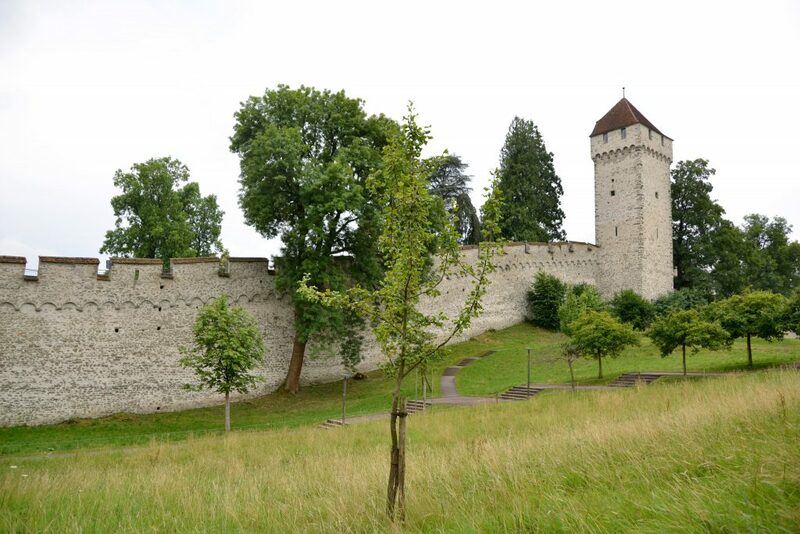 Lucerne boasts yet another landmark from the 14th century: the Musegg Wall. This fortification was built in the Middle Ages in order to protect the city. Nine towers can be found along the wall and 4 of them are open for visitors to climb up and explore. 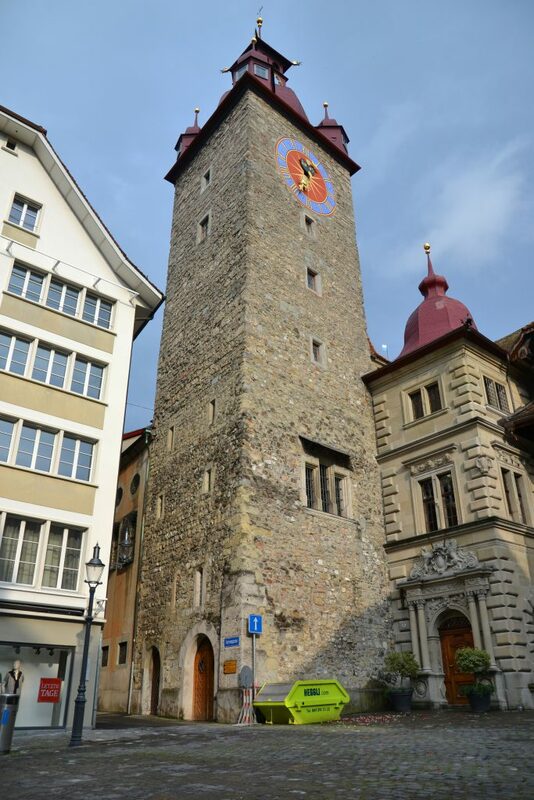 The Zyt Tower, which is one of the four you can enter, is home to the Lucerne’s oldest city clock. 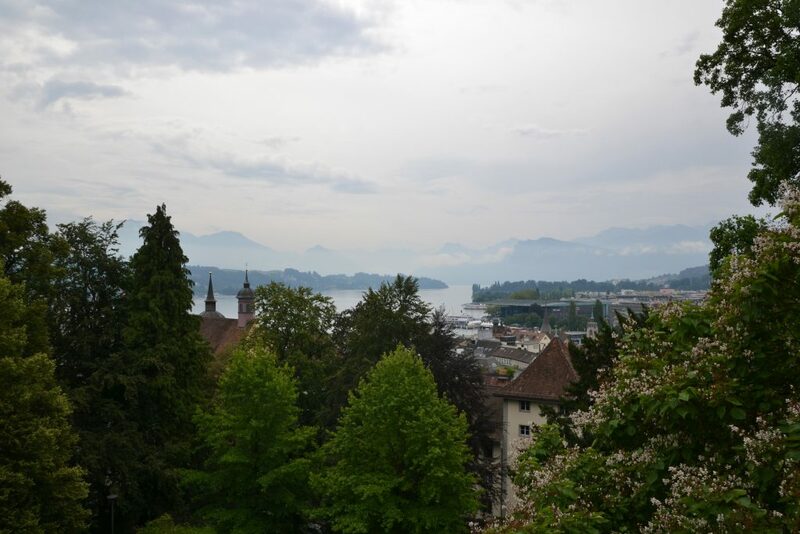 From the wall and towers, you can get a bird’s-eye view of Lucerne, Lake Lucerne, and the Alps. If you’ve read any of my other posts, such as my Munich post, then you’re well aware of my obsession with bird’s-eye views. 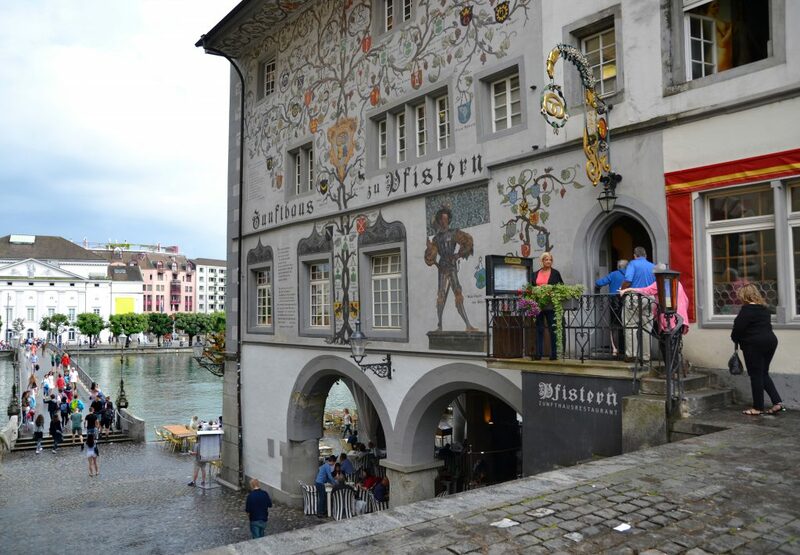 In addition to the Chapel Bridge, the Musegg Wall is definitely a site in Lucerne that I wouldn’t dare miss. The wall and towers are open from April 1st – November 1st, 8 am – 7 pm. 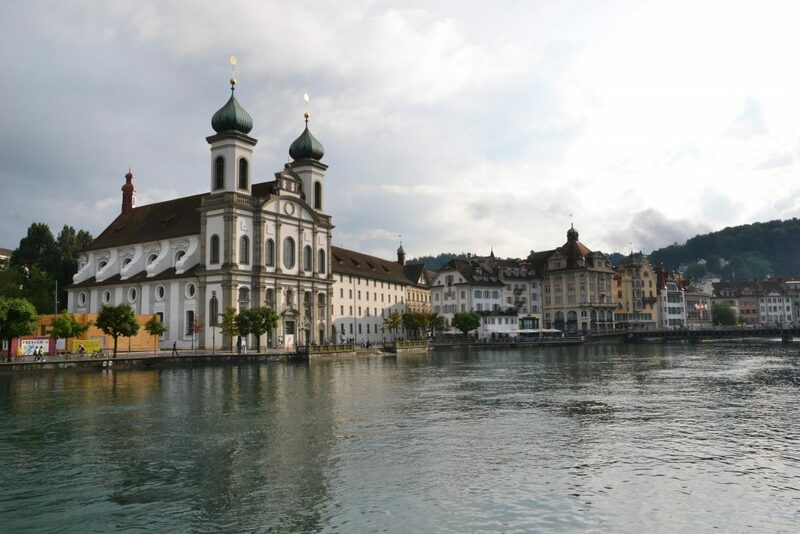 It shouldn’t come as a surprise that Lucerne also has a picture-perfect old town. After all, the city is also home to the surreal Chapel Bridge and the Medieval Musegg Wall. You can seriously spend hours wandering around the Old Town. Personally, I was a fan of admiring the elaborate murals adorning many of the buildings and straining my neck muscles in order to marvel at the clock towers. (It’s well worth the pain). As always, walking is absolutely free. As well, any of the bridges crossing the Reuss River are a great spot for snapping some stunning Old Town pics. Now, before I explain why I recommend buying this bus pass, I want to make it clear that I do not consider riding Lucerne’s public transit an exceptional tourist attraction. I chose to present this ticket as its own point with its own title, so that I could emphasize that this is the only moment where I’m encouraging you to spend some Swiss Francs. This bus pass, unless you have a bike or car, will let you get to the base of Mt. Pilatus and back. You can take Bus 1 (Kriens) from the public bus terminal at Lucerne’s Hauptbanhof and get off at Kriens, Zentrum Pilatus. Then, follow the signs to the base. This route will only take you to the gondola and hiking trails – not the cog railway. If you want to learn how to reach the cog railway, check out Mt. Pilatus’ arrival information page by clicking here. Why should you visit Mt. Pilatus? Well, you’re in Switzerland! It’s THE land of the highest Alps, and Pilatus happens to be mountain massif located on Lucerne’s doorstep. For me, a trip to Switzerland is not complete unless there’s a mountain involved. If you’re considering renting a bike to get to the mountain base, note that it’s actually cheaper to get a 24 Hour Zone 10 ticket than to rent a bike from Lucerne’s Rent-a-Bike Service (27Sfr for half a day). As well, 2 one-way bus tickets add up to the same price as the 24-Hour Zone 10 Ticket, so you might as well go for the 24-Hour Ticket. There is absolutely no charge for using Mt. Pilatus’ hiking trails. If you’re on a quest to see some magnificent mountain views, grand forests, and some cute little waterfalls, embark on a hike up Mt. Pilatus from the Kriens base. 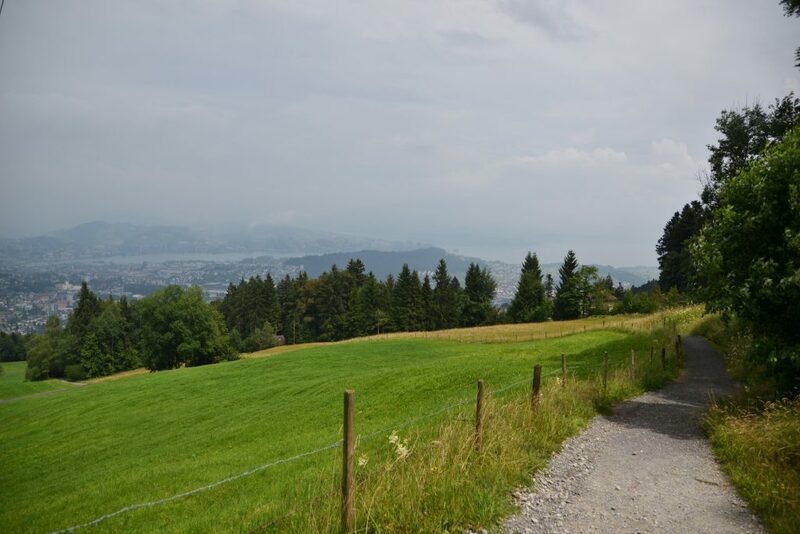 There’s an easygoing hike from the Kriens base up to Krienseregg, which is the lowest “mountain edge” of the Pilatus massif. It’s possible to continue up to Fräkmüntegg and the higher summits, but you need to be ready to spend hours upon hours committing to the hike. You also need to be well-equipped. 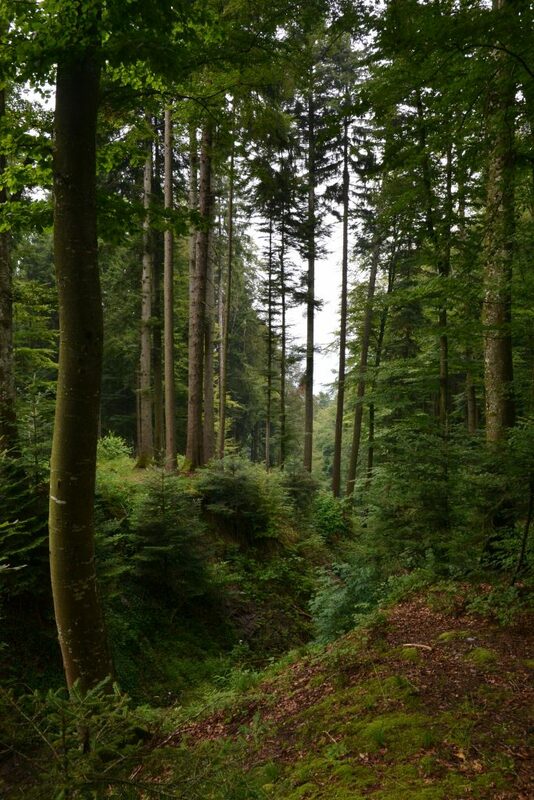 I completed the hike to Krienseregg on a complete whim. The child in me actually wanted to go down Pilatus’ mountain toboggan run, but the inconsistent, stormy weather had shut the run down earlier that morning. 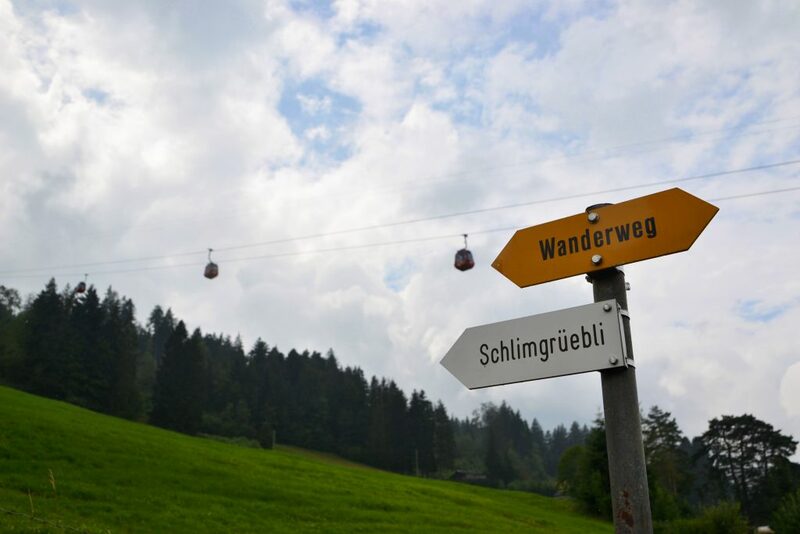 I wasn’t too crazy about paying 10Sfr for a 10-minute gondola ride up to Krienseregg or 20 Sfr to Fräkmüntegg (these prices are one-way only), so I decided hike up. It was rainy. I had a half-full water bottle in my hand and old Converse on my feet. Yet, I more than managed to complete the trek and had an incredible time. I wasn’t about to let rain stop me from enjoying my one afternoon in the Alps. Obviously, Mother Nature rewarded me for my decision, because when I reached the top, the clouds cleared and the sun came out. 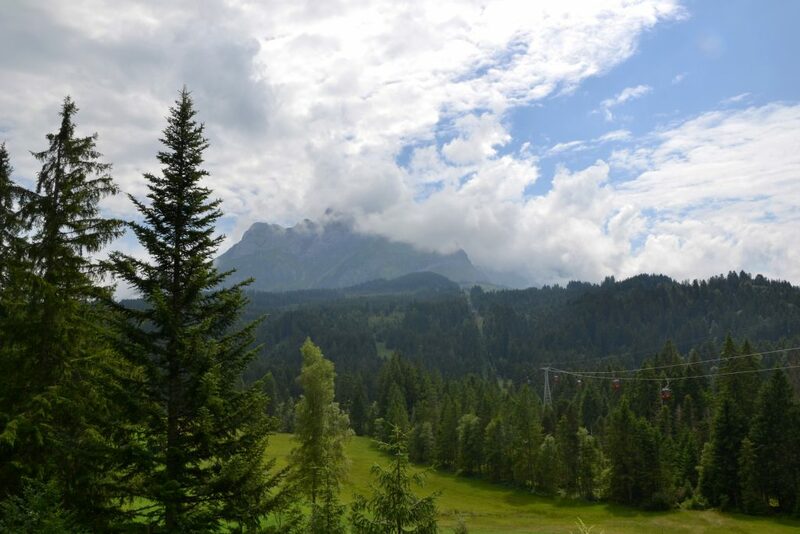 Click here to check out a detailed overview of Pilatus’ hiking trails (see page 2). The individual operating the Pilatus ticket centre in Kriens informed me that it would only take one hour to reach Krienseregg from the base. I’m not sure where that bit of information came from, because it took me nearly two hours to reach it…but then again, I did get carried away with my camera on a number of occasions. You’ve spent 8.20 Sfr on a Zone 10 Day Ticket. This means you have 11.80 Sfr left for the day. I hope I’m not letting you down when I say that you’re going to have a hard time dining in restaurants with that sum. 11.80 Sfr probably won’t even cover a single meal out…if you’re lucky, it will cover an appetizer. Fortunately, you can find quite a few grocery stores in downtown Lucerne. My personal favourite was the Coop Luzerne Banhof in the main train station. There, you can get your hands on a multitude of ingredients in order to make your own snacks and meals. If your accommodation doesn’t have any cooking facilities, you can also buy many pre-made dishes from the supermarket. Of course, if your budget allows, go and eat out. However, if you’re on a mission to save as much money as possible, shopping for food at the grocery store will be your best bet. When I was in Lucerne, I stayed at the Luzern Youth Hostel. 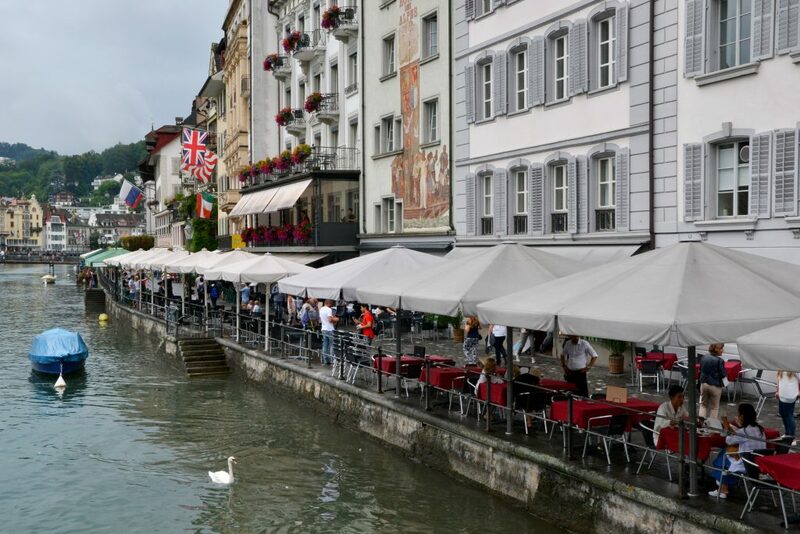 Overall, there are only a few hostels in Lucerne’s downtown area, and staying in one of them is usually the most affordable accommodation option. I’m going to stick to telling you about the Luzern Youth Hostel since that’s the hostel I’m familiar with. I paid roughly $41 (USD) per night through booking.com. The price per night I found on booking.com was cheaper than the price found on Hostelworld, so if you plan on staying in the Luzern Youth Hostel, I recommend checking prices on both sites. I stayed in a 20-bed all-female dorm (solo travel yo!). Sharing a room with 20 other people may sound pretty crazy, but the room itself was huge and canvas partitions divided up the room into smaller sections with only 2 bunks. Breakfast was also included in the price. This massive hostel was super clean and seemed to have this college residence vibe, which made me nostalgic for my university days. (However, I promise you that the dorms were really quiet at night). If staying in a 20-bed dorm is not your cup of tea, there are also 6-bed dorms, quadruple rooms, and single rooms. The hostel is 2 km from Lucerne’s main train station. You can easily get to the hostel by bus or on foot. I walked to and from the hostel the first few times and really enjoyed the experience. The walk takes you through Lucerne’s Old Town, the Musegg Wall, and the most perfect residential neighbourhood. I’m actually a huge fan of the hostel’s location. It’s super calm at night (in contrast to the train station hostel fiasco I experienced in Lisbon…but more about that another time). You can check out Booking.com’s Luzern Youth Hostel page by clicking here. And in case you’re wondering: yes, I would stay at this hostel again and again. 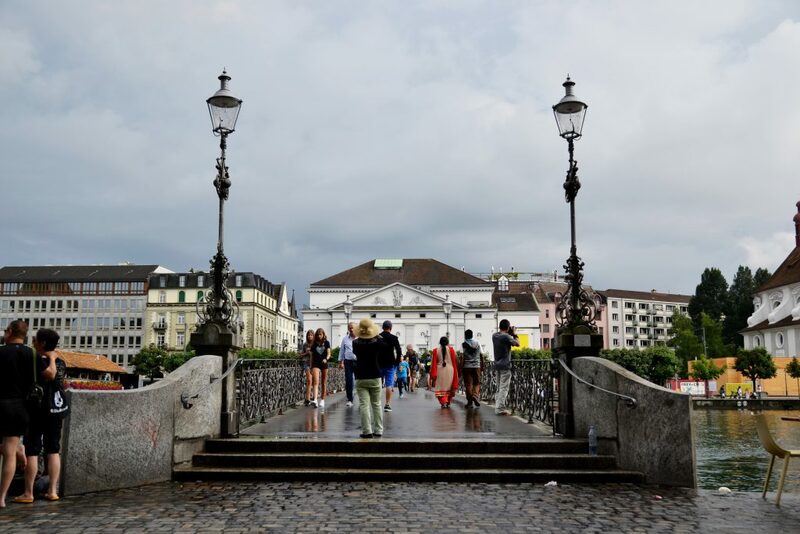 Sure – Lucerne, Switzerland can be an expensive city to visit, but with some careful planning, it’s completely possible to explore the city on a budget. Now that I’ve been to Zurich and Lucerne, I’m head-over-heels obsessed with Switzerland, and of course, I know there’s still so much more of Switzerland that I need to explore. You can count on me paying the country more than just another visit and sharing the best budgeting tips and tricks with you! Stay Tuned and Happy Traveling! 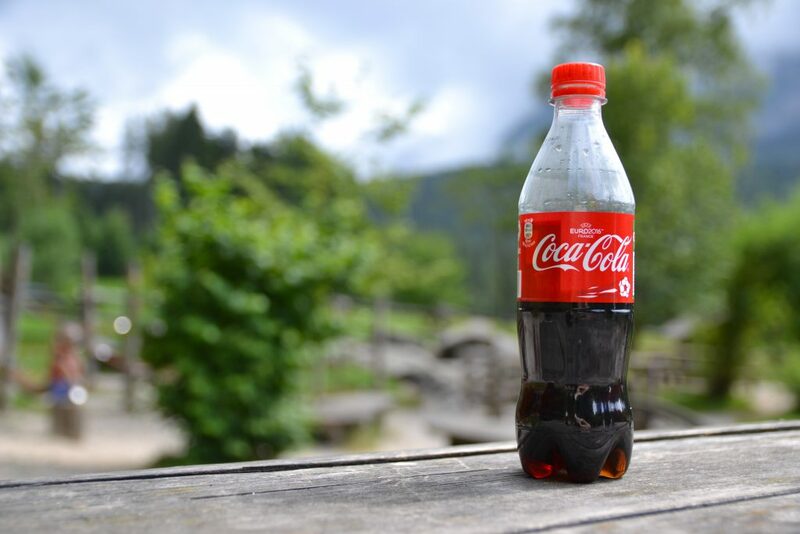 A glamorous shot of the most expensive bottle of Coke I ever purchased. It cost 5Sfr. This expenditure was definitely the result some poor planning. Next time I even consider going on a hike, I WILL pack snacks. The mad craving I got for sugar once I reached Krienseregg was so overwhelming. I gave in and bought the silly soda. Do you have any tips for visiting Lucerne on a budget? This post contains affiliate links. If you purchase/book any of the linked products or services, I will earn a small commission. There’s no extra-cost for you. Any earnings will simply be used to keep snowtoseas.com going. Thank you for your support! Awesome tips! Definitely a place to add to my travel list. I love just walking around and exploring, you never know what you’ll find. 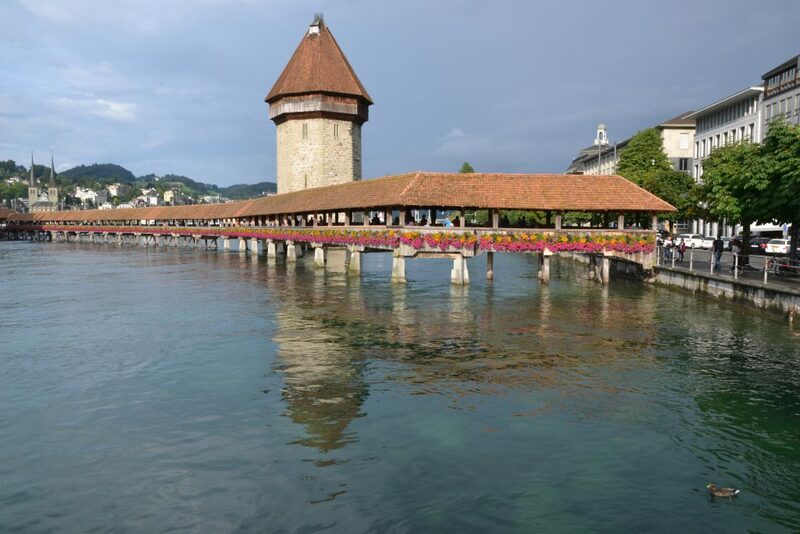 Some of the best sites and attractions are only accessible on foot too – take the Chapel Bridge and Musegg Wall in Lucerne! Mt. Pilatus looks amazing! Thank you for this! I found that Switzerland is among the most expensive countries I’ve been to including Japan and Iceland. As for accommodations, we stayed at a jail hostel, it was creepy to say the least. 😛 But I agree with you that walking around Luzern already makes the trip there worthwhile! Aw man! I wish I had found this post when I was travelling Europe for the summer. I ended up making my trip a little shorter than originally planned, and crossed off Switzerland because I thought that was going to be the most expensive. I’m going to have to go back now! It’s definitely more expensive than other countries, but there ways to make it a lot more affordable. I do hope that you get the chance to go! Wonderful tips! Hubby and I would always squirrel things away from breakfast to have for lunch to save a few $$. Walking is such a great way to see a beautiful city. I usually do the same – make an extra sandwich during breakfast and sneak it out of the room with me. I never really knew very much about Lucerne, but thanks to your post I’ve noted the best things to see and do there. Thank you! Looks stunning. I’ve always wanted to go to Switzerland, ever since I had a coocoo clock when i was younger! Interestingly, a milk company where I live is called Lucerne, but I never knew that there was a place with that name. In retrospect, it makes sense. This town looks so lovely! I love all the green and the architecture is awesome. Your post is so informative! Thank you for sharing all your tips. This is great information for planning a trip. It’s been a few years since we traveled overseas, so I think we are due for a trip! I wish I had been more prepared! I definitely would have continued on hiking then! I am heading to Switzerland this September maybe we would consider to swing by Lucerne. Thanks! Oh this looks beautiful! It also makes me a bit sad because once on a grand European road trip we got lost and ended up camping just outside of Lucerne but had no idea, so we had the chance to go but didn’t know that it was there! I do hope you get to go back! Thank you for the comment! I definitely think that if you plan ahead, it’s totally possible save! 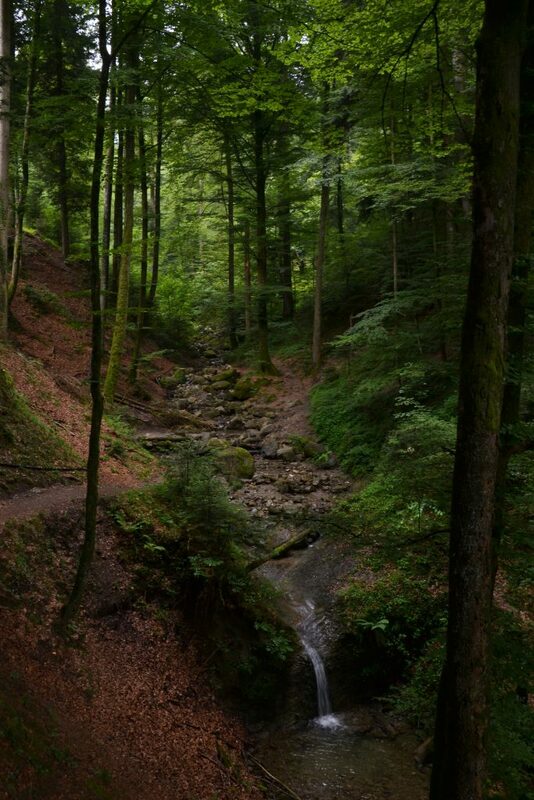 Awesome post with great photos 🙂 Loved the forest! I love Lucerne! I can’t say I did a great job of staying on budget there, but you have some great tips. Next time I go back, I want to hike the entire way up to Mt. Pilatus! 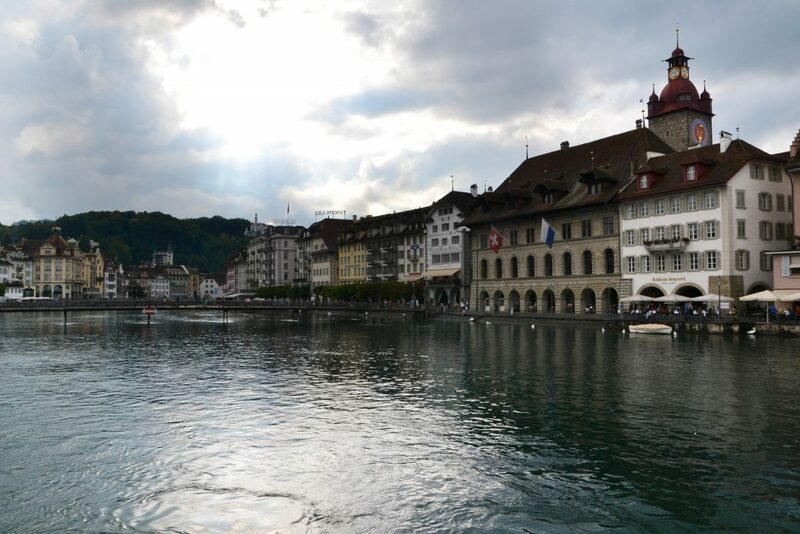 I loved Lucerne when I visited! Such a beautiful city and I love hiking so hiking around Mt Platis was amazing! I’ll have to try some of your other hikes and free things to do when I go back!! Thank YOU! And I do hope that you fit it into your itinerary! Ahh this post brings back so many good memories! I was there around this time last year and LOVED it but yeesh you are so right – it’s not the most budget friendly city haha. I remember even a McDonalds burger + combo was something like $20USD! Besides food + accom though, it’s nice to see most of the best things to do are free. This guide is awesome! wish I had it when I went haha. PS: Sorry about the expensive Coke… bet it tasted good though haha. Thank you so much for your comment! It really, really means a lot! In all honesty, I was actually really pleasantly surprised that best things to do were free! I could totally imagine being charged to explore the Musegg Wall. And yes – the coke was great! Lucerne looks so beautiful and your pictures are stunning! I always look to travel as cheaply as possible too so guides like this are so helpful, especially in traditionally more expensive places! Thank you so much! I hope this guide helps you plan a future trip to Lucerne! Great tips! I’m adding a few of these to my Euro itin. So much FREE beauty here, my favorite! I was so delighted when I visited Lucerne a few years ago. The covered bridge was my favorite part. Oh, and the lion! Very informative post. thank you for the tips! im in lucerne right now and this is helpful. also, just to share, most hotels (or in my case Airbnb), provides the Lucerne Visitor Pass and if you have it, you get to travel for free on buses and trains within zone 10. so that’s free bus to kriens if you intend to go up mt pilatus. Great Post!!!! Lucerne caught my eye when looking for day trips from Basel. 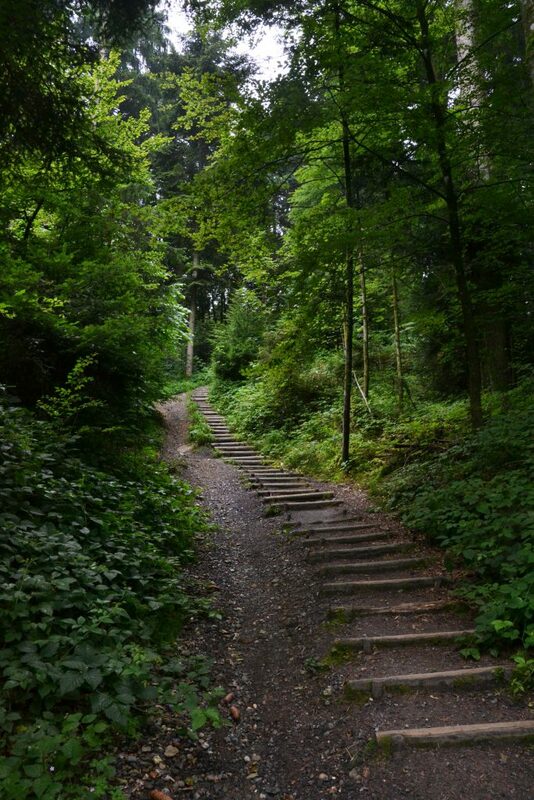 But I did not know there was an hiking trail as well. Will definitely do the Mt Pilatus trail. Very informative.